Each day Summit students experience a nutritious and appealing lunch menu. The dining environment and experience are on a par with the exceptional curriculum in which we engage our students. The Anne Coggan Johnston Dining Room for Young Children was conceived as a place where children could carry over their understanding of nutrition, healthy living, and social skills and responsibility daily. Sunbutter and Jelly or Sunbutter Sandwiches are available everyday. Visitors are welcome to join us for lunch in the Anne Coggan Johnston Dining Room for Young Children starting October 1. The cost for each guest is $5.00. Please be sure to pay in the Business Office and sign in on the sheet in the Dining Room. To avoid overcrowding, we will limit the daily number of guests to two per homeroom. Please call ext. 1000 for reservations. 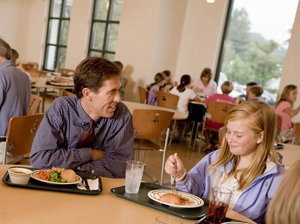 While you dine with the children, we ask your help in engaging all students in conversations, reminding them of good manners and assisting them with clean-up routines. We look forward to your visits. ** Fresh Fruit is served with all meals. The Dining Room for Young Children does not use peanut-based products due to student allergies. For this reason, please do not send peanut products to school with your children.